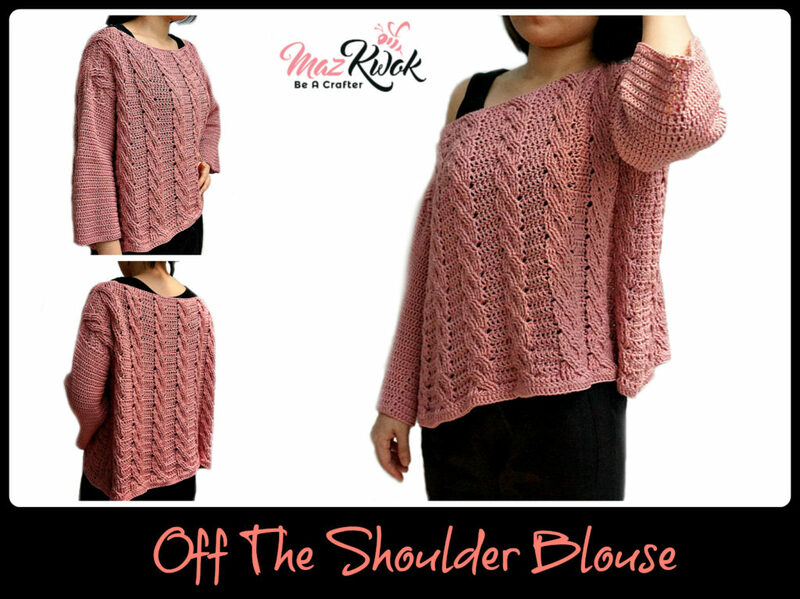 This is one of my favorite blouse types, long sleeves with boat neckline – chic and flattering for any body figures. Also, you have more than one way to wear this top. 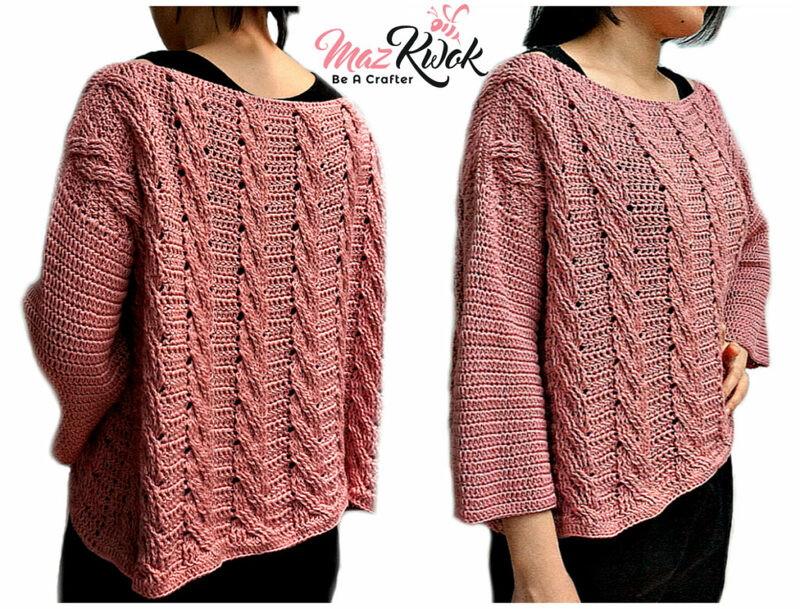 The crochet pattern is designed by mainly simple stitches and embellished with cable lines. 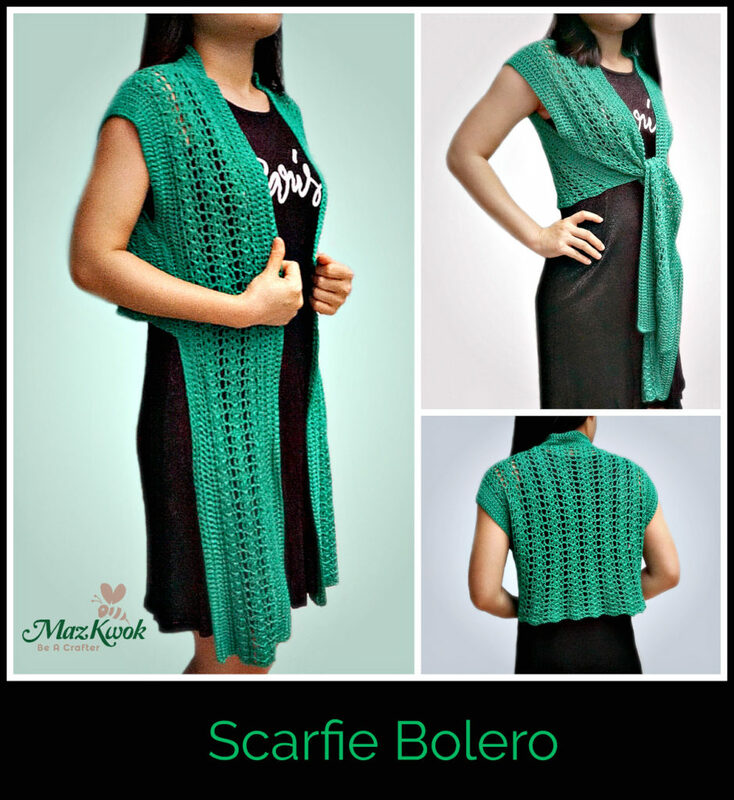 This crochet pattern is done by 2 identical front and back parts, seam to join shoulder and body lines. The sleeves are crocheted continuously from the armholes. skip 3 sts, fptr around each of next 3 sts, working in front of the fptr just made, fptr around each of 3 skipped sts. R1: Ch 119, dc into 3rd ch from hook ( first 2 ch doesn’t counted as 1st dc ), dc across, total 117 dc, turn. R2: 5 dc across, 3×3 fptr left cross, 3 fpdc around next 3 sts, ( 5 dc across, 3×3 fptr left cross, 3 fpdc around next 3 sts ) x 7 times across, 5 dc across, turn. R3: 5 dc across, 9 bpdc around next 9 sts, ( 5 dc across, 9 bpdc around next 9 sts ) x 7 times across, 5 dc across, turn. R4: 5 dc across, 3 fpdc around next 3 sts, 3×3 fptr left cross, ( 5 dc across, 3 fpdc around next 3 sts, 3×3 fptr left cross ) x 7 times across, 5 dc across, turn. R5: 5 dc across, 9 bpdc around next 9 sts, ( 5 dc across, 9 bpdc around next 9 sts ) x 7 times across, 5 dc across, turn. R6: 5 dc across, 3×3 fptr left cross, 3 fpdc around next 3 sts, ( 5 dc across, 3×3 fptr left cross, 3 fpdc around next 3 sts ) x 7 times across, 5 dc across, turn. R7: 5 dc across, 9 bpdc around next 9 sts, ( 5 dc across, 9 bpdc around next 9 sts ) x 7 times across, 5 dc across, turn. R8: 5 dc across, 3 fpdc around next 3 sts, 3×3 fptr left cross, ( 5 dc across, 3 fpdc around next 3 sts, 3×3 fptr left cross ) x 7 times across, 5 dc across, turn. Repeat ( R5 to R8 ) x 9 more times untill you reach R44. R45: 5 dc across, 9 bpdc around next 9 sts, ( 5 dc across, 9 bpdc around next 9 sts ) x 7 times across, 5 dc across, turn. Seam body lines with sl or sc ( 32 rows from the bottom up ). The sleeves are crocheted continuously from the armholes. R1: from the right side, insert yarn and hook into the place you made the last sl or sc of seaming body line, dc around ( make 2 sts into each dc bar ), total 56 sts, sl into 1st stitch to join. R2: 56 dc around, sl into 1st stitch to join.